Now in its eighth year, RM Auctions’ annual London sale, has gained a reputation for bringing a world-class collection of cars to market, offering a broad selection of vehicles to cater to a diverse range of automotive tastes and budgets. From imposing Edwardians to modern era supercars and modest market investments to magnificent million-pound automobiles, RM’s London sale is well established as one of Europe’s finest and most comprehensive collector car auctions. 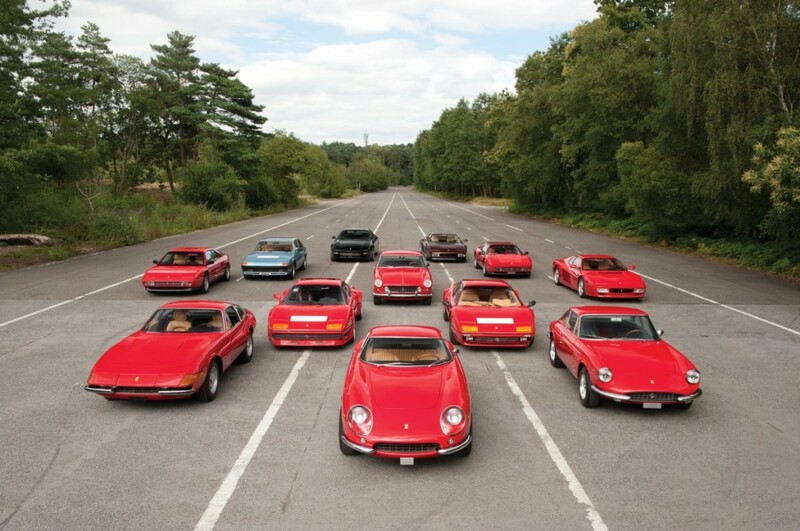 Reinforcing RM’s position as the world’s pre-eminent specialist in the sale of classic Ferraris, the upcoming sale is led by a roster of no less than 20 examples from the famed Italian marque, 12 of which come from a single private collection in Switzerland. With models spanning more than three decades of production, enthusiasts of the legendary marque can choose from a stylish 1961 250 GTE (Est. £180,000–£240,000) through to another of the great 2+2 V-12’s of the modern era, a 1995 456 GT (Est. £40,000-£60,000). The undoubted star of all the Ferraris consigned to date is the 1966 275 GTB, chassis 8199, which is a wonderful example of this rapidly appreciating and much-in-demand 1960s GT car, featuring the highly desirable long-nosed, alloy-bodied configuration (Est. £1,900,000–£2,200,000). Other notable early Ferrari highlights represent a broad cross-section of the marque’s road going models from the 1960s through to the 1990s, including beautiful examples of such iconic models as a 1968 330 GTC (Est. £400,000–£500,000), a 1972 365 GTB/4 Daytona Berlinetta (Est. £450,000–£550,000), and a 1989 F40 (Est. £395,000-£495,000). Max Girardo, Managing Director, RM Auctions, Europe, says: “RM is the world’s leading seller of classic Ferraris, and it is fantastic to be able to feature such a broad selection of the marque’s finest road cars at our London sale. We have a strong reputation for quality, and it’s important to note that the Ferraris on offer are of a particularly high standard, with many being incredibly low mileage examples and presented in almost ‘as new’ condition. The market loves the best, and we are certainly offering the best in London”. The London auction is not only about Ferraris, and nothing contrasts better with post-war Italian exotica than the pre-war glamour of French Bugattis. RM will present three glorious examples at the upcoming sale, from an early sporting Type 13 through to the splendour of two Type 57s, the ultimate 1930s grand routier. The 1920 Bugatti Type 13 ‘Brescia’, chassis 981, was manufactured in Molsheim before being delivered to its first owner. With its low weight and technically advanced 16-valve, overhead-camshaft engine, the Type 13 was considered state of the art for its time, as illustrated by the model’s exceptional period competition history. Well-documented, and benefitting from a meticulous specialist restoration, chassis 981 has been a well-loved and much campaigned car, and is expected to fetch between £285,000 and £330,000. The Bugatti Type 57s of the 1930s are truly worthy of the term “iconic”. With their magnificent straight eight-cylinder, supercharged engines, which were derived from Bugatti’s highly successful Grand Prix cars of the period, the Type 57 boasted exceptional performance, which owners could combine with a number of different, and invariably beautiful, coachbuilt bodies. Two such cars will be offered in London, a 1937 Type 57C Stelvio with coachwork by Gangloff and a 1938 Ventoux example. In the tradition of coachbuilt cars, Ventoux-style cars differed from one another in certain respects, and chassis 57701 was delivered new in 1938 to Bugatti’s Swiss agent having been purchased at a “special” price of 82,000 French Francs. Today, it carries a pre-sale estimate of £300,000–£335,000. The other car, chassis 57467, sports the lovely drophead Stelvio bodywork from the famous Gangloff Works. Commissioned by the Bugatti factory, it was completed in 1937 and delivered to Bugatti’s Lyon agent, where it soon found a home with a local customer. Much in demand in today’s market, it is estimated to achieve between £595,000 and £715,000 at the upcoming sale. For further information on RM’s London auction, to view a frequently updated list or entries, or to discuss limited consignment opportunities, please contact RM’s London office at +44 (0) 20 7851 7070 or visit www.rmauctions.com.